This is a review of Tea Tree and E Oil which is manufactured by Derma E. This product claims to act as an antiseptic and antioxidant for your skin. Read on to find out whether Tea Tree and E Oil is right for you and your symptoms. This oil is a blend of 75% Tea Tree Oil and 25% Vitamin E. Tea tree oil is a very common oil that is used for a wide variety of skin afflictions including cuts, fungal infections, blisters, insect bites, allergic reactions and eczema. It is also used in household cleaning products. Tea tree oil is widely regarded to be an antiseptic as well have antibacterial and anti-fungal properties. 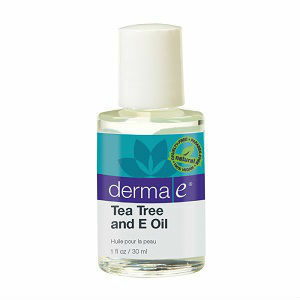 Derma E added Vitamin E to the blend in order to help ease the dryness that tea tree oil can cause. Vitamin E is well renowned for providing moisture to the skin and it is often used in after-sun products. The ingredients and manufacturing processes offer the following qualities: vegan, GMO- free cruelty-free, sulfate-free, paraben-free, lanolin-free and gluten-free. Derma E states that for general use you should apply the oil to the affected area once a day. However, to remove fungal infections, you will need to apply it twice a day. Make sure that your skin is clean and dry before applying this oil. This product is intended for external use only. It should not be ingested and it should be kept away from the eyes, nose and mouth. If you are pregnant or breastfeeding, consult your doctor before using this oil. Tea tree oil is safe to use in low doses on the skin. However, some people may experience dryness or irritation when they use this oil. Tea tree oil is toxic if ingested. Side effects of ingesting tea tree oil by mouth include confusion, unsteadiness, rash, inability to walk and sometimes a coma. When combined with lavender oil, tea tree oil may produce abnormal effects on young boys who have not yet gone through puberty. It is possible that these oils may have an effect on the hormones causing abnormal breast growth. Vitamin E is safe when applied to the skin as long as you do not exceed 15 mg. The product is for sale by the manufacturer for $14.95. The product is also for sale on Amazon at a reduced price of $12.34 which has been marked down from $13.10. Derma E offers a 100% money back guarantee that states that you can return their product for a full refund. If the store you bought it at will not accept the return, you may return it directly to Derma E along with the receipt within 45 days of your purchase. Tea Tree and E Oil by Derma E is a product that claims to provide a solution to a variety of skin ailments including cuts, acne and fungal infections. They offer an inexpensive product and a generous guarantee. However, there is no timeline within which to expect results from this product and using tea tree oil can cause further dryness to the infected area, which may be painful. Jimmy Rodriguez	reviewed Derma E Tea Tree and E Oil	on June 10th	 and gave it a rating of 3.5.